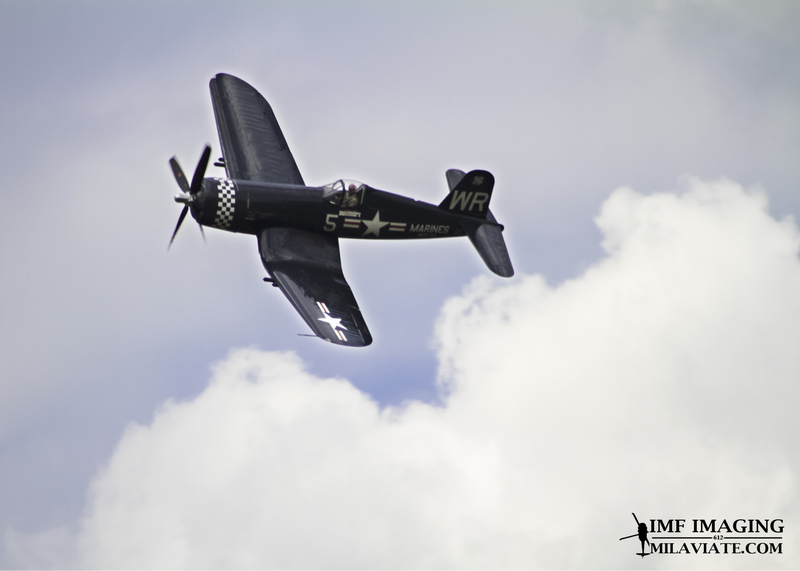 The Vought F4U Corsair’s distinctive design made it an icon amongst the warbirds. The Japanese nick-named her the “Whistling Death” due to the sound the engine air inlets made as she sped towards them. This aircraft was truly a work of supreme engineering, which pushed the boundaries of the level of aeronautic technology at that time. On February 1, 1938, the US Navy Bureau of Aeronautics challenged the United Aircraft Corporation (parent company of Vought-Sikorsky) to build a single-engine high performance, carrier based fighter with a maximum stalling speed of 70mph and a range of at least 1000 miles. At the time, C. J. McCarthy was the General Manager at Vought-Sikorsky. He put together an expert team to tackle this challenging assignment. Rex Beisel, the company’s chief engineer, became the project manager. The other team members were Frank Albright, the project engineer; Paul Baker, the aerodynamics engineer; and James Shoemaker, the propulsion engineer. The initial draft for the Vought V-166-A entailed the Pratt-Whitney R-1830 Wasp engine. This engine was a 14-cylinder, double-row, air-cooled radial engine, averaging 78hp per cylinder. For the second draft, the Vought V-166-B, it was decided to use the experimental XR-2800-4 version of the Pratt & Whitney Double Wasp instead. This 18-cylinder, two-row air-cooled, two-stage supercharged radial engine was the most powerful engine at the time with over 100hp per cylinder and was also used on the Grumman F6F Hellcat and the Republic P-47 Thunderbolt in later years. To convert all that horsepower into thrust, the Hamilton Standard Hydromatic, 3 blade prop with a 13 feet 4 inches diameter was chosen. This created a problem with the deck clearance, and so the engineers were facing a dilemma. Extending the landing gear, or shortening the prop. Both options had their disadvantages. A larger landing gear would be more difficult to stow in the wing and would result in more weight. Yet, if the prop were to be shortened, it would mean wasting much of the horsepower created by the impressive engine. The engineers came up with a creative solution; the distinctive inverted gull-wing design. This allowed the prop to clear the deck and the landing gear to remain short and strong. A beneficial side effect of this design feature was the improved aerodynamics, resulting in a higher top speed. The wings also featured integral fuel tanks, and the oil cooler and supercharger air intakes in its leading edge. For improved storage aboard aircraft carriers, the wings had the capability to fold upward. For the fuselage, Rex Beisel opted for an all-metal circular design, which would match the diameter of the XR-2800-4 engine. The cockpit was a heavily framed canopy located abeam the wings’ trailing edge. This streamlined design further improved the aircraft’s aerodynamics, but limited the pilot’s forward visibility. The retractable gear featured Boeing’s swivel gear, which allowed to wheels to swivel 90º and retract straight back to fit flat inside the bottom of the wing. The artillery consisted of a total of six Browning .50 caliber machine guns; two mounted in the nose and two on each wing. The V-166-B draft was what eventually became the final design for the XF4U-1. Our very own Lambo in the Corsair! The main problem the XF4U-1 faced, was the reduced forward visibility, making landings on aircraft carriers nearly impossible. With the traditional traffic pattern, the pilot was unable to see the Landing Signals Officer’s instructions while the plane was on final approach. Furthermore, carrier deck landings required the plane to be at stall speed as the tail-hook caught the deck wire. The unfavorable stall characteristics caused dangerous situations. The left wing would drop drastically, which often lead to a collapse of the landing gear, causing severe pilot injury and aircraft damage. Due to these issues, it was decided that the F4U was more suitable for land-based operations with the US Marines. In 1944, the British developed a safer method to land the F4U on aircraft carriers; this technique resembled more of a power-off 180 than a traditional traffic pattern. The continuous turn towards the carrier allowed the pilot to maintain visual contact with the Landing Signals Officer all the way until committing to the landing, or receiving the go-around signal. The US Navy incorporated this landing technique and managed to operate the F4U Corsair very successfully aboard their aircraft carriers. A further problem the development team faced, was that the aircraft leaked oil and hydraulic fluid during flight, which would seep out of the engine compartment, via the cowl flaps, and all over the windshield. This issue was easily solved by wiring shut the cowl flaps on the top engine compartment, which diverted the oil and hydraulic fluid around the sides of the fuselage. Test flight results indicated a top speed of 405mph, a maximum range of 1,070 miles and a maximum weight of 10,074lbs. After evaluating the results of the test flights, the US Navy was very satisfied with the final design of the XF4U-1 and ordered 584 copies in June 1941. Between 1941 and 1952, more than 12,500 F4U’s were ordered and produced. During its lifetime, the F4U underwent more than 950 engineering alterations to accommodate specific types of operations. The most successful version of the Corsair was the F4U-4. A newer Pratt-Whitney R-2800-18W engine was installed, which produced 2,100hp during normal operations, and even 2,450hp for up to 5 minutes with the methanol-water injection boost. Furthermore, the 3-blade prop was replaced by a 4-blade prop. The two Browning .50s mounted in the nose were removed and all six machine guns were mounted in the wings outside the propeller arc which eliminated the need for synchronization. Its top speed was 446mph. 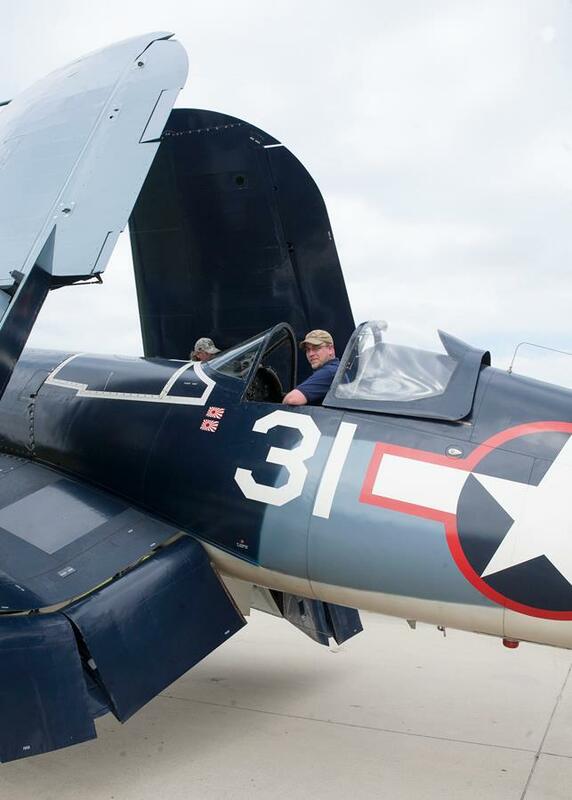 The Vought F4U Corsair has an outstanding combat record and was used by the US Navy, US Marines, Britain, France, New Zealand and Australia during WWII. It is my favorite airplane of all time! I have a Squadron Signal book here that says the prototype did not have 6 guns. Instead each outer wing panel contained 30 small bomb bays that would house 5 lb bombs. Those bombs were to be rained down over enemy bomber formations. There was a window fitted under the pilot that he would use for sighting his bombs. This did not work out of course. The Plexiglas bottom “skin” was replaced with standard aluminum skin but right up until the final variant there was no cockpit floor, just two rails to rest your feet on.